Andy Awford has been appointed as assistant caretaker manager to Guy Whittingham following the departure of first team manager Michael Appleton, who has bagged a job with Championship side Blackpool. The pair of them sit alongside each other in Pompey’s Hall of Fame. Now Guy Whittingham and Andy Awford are serving together as the Blues’ managerial team. 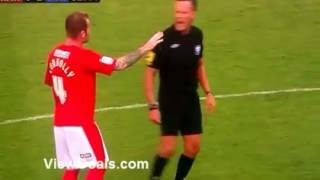 The duo will take charge of Pompey at Bury on Saturday. Awford was asked to step up from his job as Academy manager to assist stand-in boss Whittingham in first-team duties. The duo established themselves as Fratton favourites whilst playing in the same teams together. And for Whittingham, there is no-one better to serve as his right-hand man. He said: ‘Myself and Trevor Birch sat around a table and, considering the state of affairs at the moment, it had to be done in-house. ‘It was just felt we needed somebody alongside me with the football knowledge that Awfs has got. ‘Ultimately, it will be my call, but you are always open to persuasion and people see different things when you are looking at solutions. ‘I am looking forward to it. Me and Awfs are similar on our philosophy of football, anyway, having played under Jim Smith. Andy Awford, not as some might believe a local lad, but blue & white through and through nonetheless, moved to Pompey from Worcester F.C. where, when he came on as substitute in a tie at Boreham Wood, became the youngest player ever to appear in the F.A. Cup, aged just 15 years 88 days. 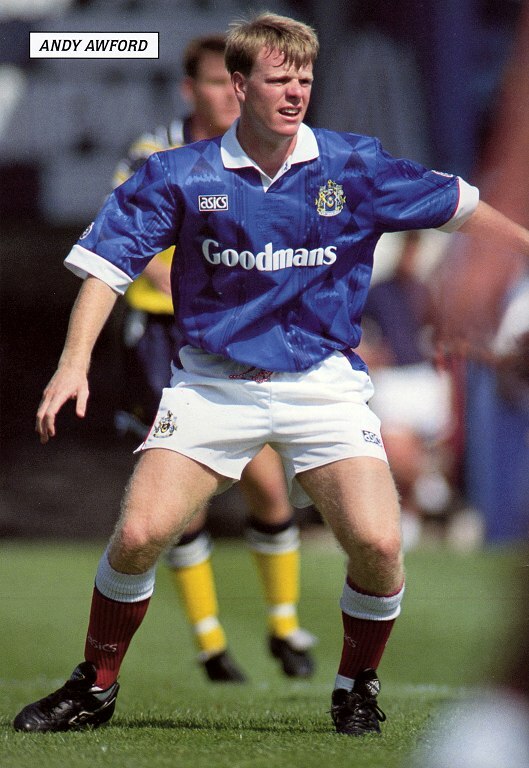 Awford's first Pompey appearance, an away fixture at Crystal Palace in April '89, saw him set another record. Due to injuries to Gavin Maguire and Graeme Hogg, Pompey manager John Gregory believed Awford had shown enough of what it takes and at the age of 16 granted him the honour of becoming the youngest ever player to play for Pompey's starting eleven. 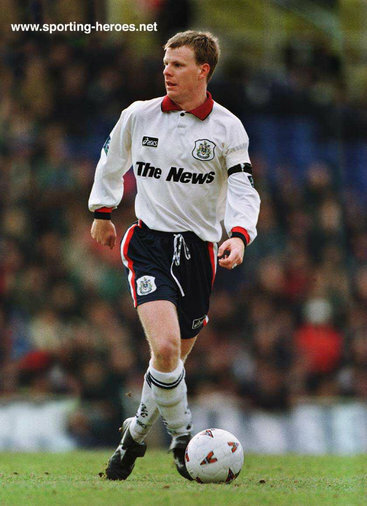 The quick and intelligent left sided player made three further appearances that season but it wasn't until 91/92 that new manager Jim Smith gave Awford, together with a number of other young players (Darren Anderton, Darryl Powell, Chris Burns to name a few) their big break. Awford played all but one game that season which included lining up against the likes of Ian Rush & John Barnes in the now infamous F.A .Cup semi-final against Liverpool. 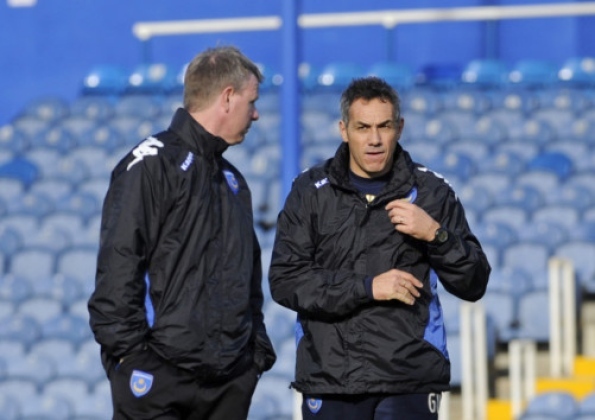 The following season saw Andy start to play alongside another youngster; Kit Symons, at the heart of Pompey's defence. Their partnership conceded only nine goals at home that season but again the campaign was to end in heartbreak as Pompey missed out on promotion by a single goal scored. Despite making over 400 appearances for Pompey some would argue that his career was a classic case of what might have been. Having missed out on the FA Cup Final and promotion in successive seasons, any hope of glory or indeed a big money move were dashed when in 1994 he suffered a number of injuries (the worse a broken leg) which kept him out of the game for over 14 months. In some respects Awford never quite recovered from his injury setbacks, but nobody could ever question his passion or commitment whenever he pulled on the famous blue shirt. 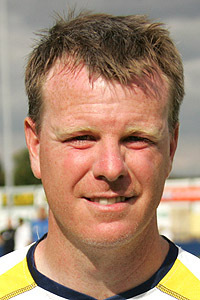 Following his retirement in November 2001 at the age of just 28, Awford took up the post of Chief Scout and later Reserve Team Coach at Fratton Park a position he held until he joined his former Pompey boss and Harry Redknapp sidekick Jim Smith as first team coach at Oxford United in April 2006. Awford began his career at his home-town club Worcester, where he became the youngest player ever to appear in the FA Cup, aged just 15 years 88 days, when he came on as substitute in a tie at Boreham Wood. Impressive displays at left-back meant he signed professional terms with Portsmouth, for whom he went on to make almost 400 first-team appearances, and helped them reach the FA Cup semi-finals in 1992. In this time he also played nine times for England under 21s. But his career is a prime case of what might have been. He missed out on the Cup final when they lost a penalty shootout to Liverpool, the following season Pompey missed promotion to the Premiership by one goal, and hopes of a big-money move were wrecked by a broken leg which kept him out of the game for 14 months. His subsequent knee problems never completely healed, and he retired following the 2000/01 season, his last competitive appearance for Pompey coming against QPR on 4 November 2000. He then took up the position of chief scout and later reserve team manager at Portsmouth. In April 2006, he was appointed the first team coach at Oxford United under Jim Smith and in June 2008 became assistant manager of Bognor Regis Town. Andy Awford resigned along with manager Mick Jenkins on 3 January 2009. In 2011 he was appointed to the role of Academy manager at Portsmouth. After retiring from the game of football, Andy Awford worked at Ditcham Park School, Petersfield where he taught PE until his appointment at Portsmouth in 2011.